this wasn't my board. Mine was huge but it was awesome!! Today was one of the best days of my life!! It all started yesterday when my friends and I were talking about how we wanted to finish the trip. We spoke about taking surfing lessons but were a bit trepidations about how we’d do and it was expensive. 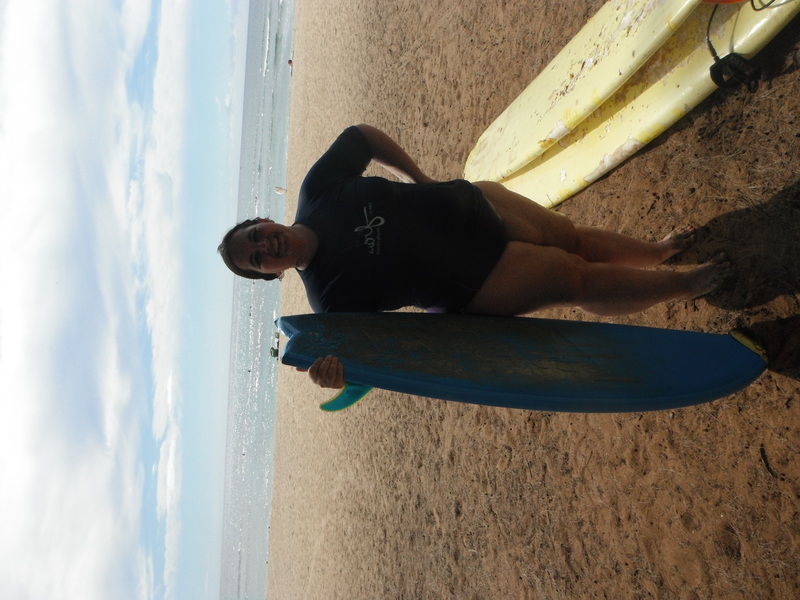 As I mentioned in my post ‘Too Fat For List’ learning to surf is something I’ve always wanted to do. Its like walking on water which who doesn’t want to do that? I have also always felt like I wasn’t in shape enough to do it because of the upper body strength required. Even now after all the training of the last year and a half I was was nervous. It is scary to attempt to complete such a big goal. After all, what if I fail? There is something devastating about such a notion. Anyway, we decided to go ahead and give it a try. (This makes 3 new experiences I had this trip- I saw dolphins, hiked through the Waimea state forest and swam in the waterfall, and went surfing! So great!). We arrived at Surf N’ Sea at 10 am and got put with our instructor, Karen. My instructor Karen. She was so great. We are so lucky to have gotten her. She was patient, kind and an experienced teacher. When we first got to the beach my surf board was too small to hold my body up. This was very discouraging and made me feel fat. I had told Karen about my weight loss and my surfing goal and she seemed personally invested in making everything right. In fact, she told me that I ‘would ride the waves today’ and that she wouldn’t let herself see me fail. (I must admit that I got a little emotional when I failed. It was pretty discouraging). She told me to show up at 2:00 pm and she would have a bigger board for me to try. She even insisted saying she’d track me down if I didn’t show up! After my roommates surfed for a 2+ hours we went to lunch and I came back at 2. The new board was huge (really a paddle board) and it made all the difference. 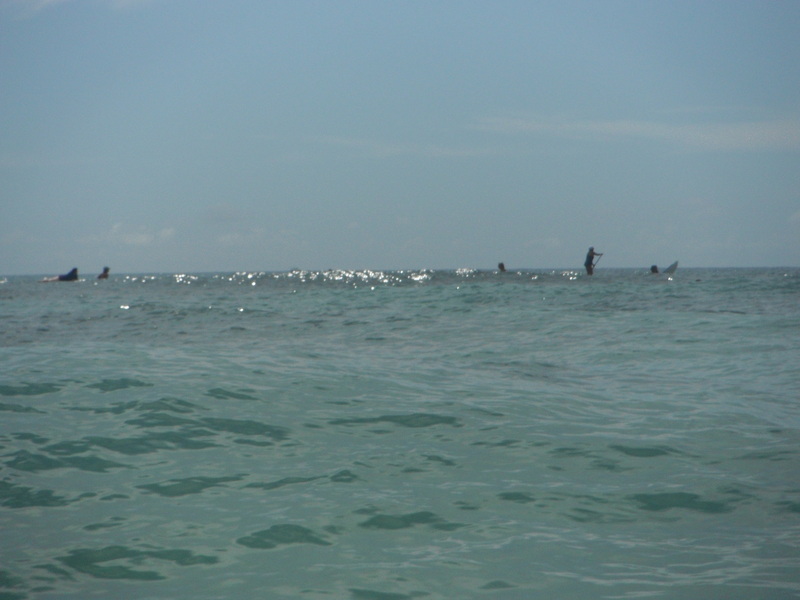 I immediately dove in and paddled my way to the waves (with the help of my teacher!). I was able to catch 4 or 5 sets of waves. I never stood up completely but I got pretty close. It was so exciting!! you can't really tell but I am the first dot to the left! I held on to the wave for while and just being able to get back up on the board again was a huge accomplishment. There is no way I could have done that the last time I came to Hawaii, let alone doing it 4 or 5 times! I couldn’t believe how much fun it was. It is a great sport because you don’t have to be perfect to have a good time. I really can’t believe I actually did it! It made me feel like all the hard work of the last year and half has been worth it. I am so grateful to Karen for giving me over 2 hours of her time just for me. She didn’t have to do that but she joined the ranks of people who believe in me more than I believe in myself. I think it is remarkable that she gave so much to someone she doesn’t know- and she did it so willingly. I hope I am that free with my time and willing to serve others. I am also grateful to my roommates for pushing me to surf. It was so great! I can’t wait until my next trip to Hawaii when I can get out on the waves again- anyone want to come with. Taking applications now? What a glorious trip it has been. There will definitely be a tear or two on my face tomorrow as I board my flight. The trips always go too fast but what a memorable one it is.